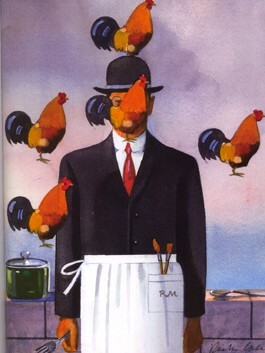 'René Magritte Faces a flock of falling fowl': . . . is actually an Asian chicken-wing recipe in SVMA's whimsical cookbook. Those of us who have spent upwards of 14 years daily repeating the admonition "Please put your napkin in your lap" know that dinner is not just one great big hullabaloo of happiness. The whole togetherness and healthy-food stuff apart, dinner with children is generally a large-plate affair featuring the ongoing boredom of the same lessons daily learned and just as daily forgotten. But for a certain strata of adults—those, say, who dandle grandchildren briefly before handing them back or those who haven't yet seen the dark side of a baby's dewy soul—dinner is often a time of gosh-darn conversation that never once touches upon the placement of napkins. What's better, it can be composed of little more than a collection of jewel-like small plates that need pay little consideration to balance between protein, carb and leafy green. Two new local cookbooks just published celebrate the adult pleasures of the gustatory interlude, replete with wine recommendations. From the dandling-before-handing-back side of things comes the Sonoma Valley Museum's delightful hometown giggle 'Sonoma Palette: Appetizers' ($19.95). Because something's always going on with the robustly active SVMA, it comes as no surprise that the museum regularly hosts a Sunday afternoon art history class taught by retired Rhode Island School of Design professor Dr. Gregor Goethals. Post-learning discussion was initially handled over wine and cheese, a tradition that soon grew to include homemade appetizers of all kinds. Now numbering 85 students, the art history class decided to take the next natural step and publish its hot app creations. The resulting book is entirely whimsical, featuring full-page illustrations that are smartly humorous riffs on the great masters whose work the students study before uncorking and tucking in. All of this good fun supports benevolence toward the recipes themselves, which are a perfect foil to any food nostalgia pangs. Gelatin is called for three times, hearts of palm cans are opened twice, cream of mushroom soup makes a brief appearance and mayonnaise figures in an unconscionable way. But isn't that how a certain generation steadied themselves for another round of martinis, and isn't this all actually really yummy? Absolutely, only these days the grownups are drinking lots of great Sonoma Valley wines. For the pre-dewy-baby's-soul set, there's 'Small Plates, Perfect Wines: Creating Little Dishes with Big Flavors' (Andrews McMeel; $16.95) by Napa writer (and former Bohemian contributor) Lori Narlock. Narlock teams up with the seemingly ubiquitous Kendall-Jackson winery, they of the recent Sonoma County Museum photography art show and coffee-table book, to make artful small meals that work perfectly with wine. This clean, easy-to-understand book, designed by Fairfax resident Jennifer Barry, is based on the way people are eating in restaurants today, sharing several small plates to make an exciting meal with differing textures and flavor profiles. Chapters are organized from salads to vegetables to seafood to meat and poultry to desserts, with an introduction by K-J winemaker Randy Ullom that provides clear, sensible tips for food and wine pairings (for example, acidic foods can make wine taste flat because the wine's own acid is masked). When serving several small plates, Narlock and Ullom suggest serving two- to three-ounce pours of several different wines that match each dish best. And if it all seems too hard figuring Zin from Syrah and Viognier from Pinot Grigio, Ullom reminds, "Chardonnay and Pinot Noir are irresistible to wine and food lovers alike." Amen. Many of the recipes that Narlock has developed would be just as toothsome served up in greater quantity. With the recent rains, we found ourselves longing to smell and serve this lovely autumn fare. Strip leaves from the chard, reserving the stems. Trim away bottom of the stems and cut into 1/2-inch slices. Sliver leaves into 1-inch pieces. Set aside. In a skillet just large enough to hold all the chicken pieces in a single layer, fry the bacon over medium-low heat, until crisp. Drain to paper towels. Increase heat to medium-high. Season the chicken liberally with salt and pepper to taste and add to the skillet, skin side down. Turn and cook until browned on each side. Transfer to plate and keep warm. Add the chard stalks to the skillet and cook until softened, about 3 minutes. Using a slotted spoon, transfer the stalks to a plate. Add the carrot, celery, half of the shallot and the thyme to the skillet. Cook until vegetables are softened. Add the wine and cook until it is almost completely reduced. Add the stock and bring to a boil. Return the chicken, skin side up. Cover and reduce heat to medium. Cook until chicken is done. Transfer chicken to a plate. Remove the thyme from the pan and whisk in the mustard. Stir in the Swiss chard leaves, cook until wilted. Add the chard stalks, the butter and 2 tablespoons of the parsley. Season with salt and pepper to taste. Heat through. Distribute the greens evenly among six shallow bowls and place a piece of chicken atop each. Sprinkle bacon and remaining parsley atop, and serve.